I left our new apartment briefly Friday morning, before the snow arrived, using power wheelchair. I didn’t leave again until Sunday morning, driving our car this time. On Sunday we went to Creve Coeur, Brentwood, and a few other places. By then roads were generally acceptable, but I can imagine how bad they were Friday night. I saw the news reports of motorists in traffic for hours/overnight. 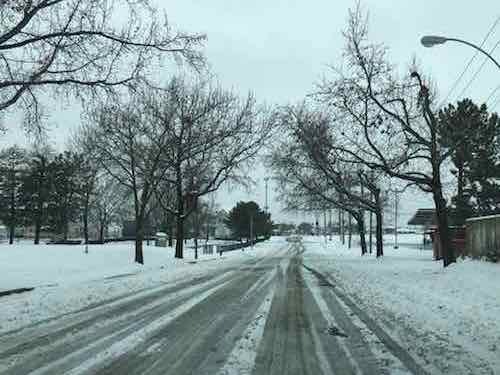 Q: Agree or disagree: Given the amount of heavy wet snow we received, state/county/local road crews did the best they could. A little more than half think the crews did a good job considering. Agreed, in general I think the people behind the wheels of the snow plows do a great job at a thankless job. It’s their bosses that don’t always get it right. Yesterday we drove to IKEA and leaving I noticed they hadn’t cleared the public sidewalk, nor their accessible routes from the public sidewalk to the entrance — they’d piled snow on them! More snow expected this weekend.